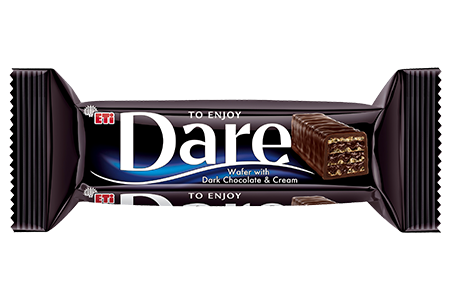 "Dare chocolate wafer bar is for those who love dark chocolate. It brings a very intense sensorial experience, that stimulates your senses and makes you give in to pleasure, due to its combination of overflowing dark chocolate cream, layers of wafer melting inside the mouth, and the dark chocolate coating. Dare is an innovative product of great quality, that generates preference for the dark chocolate taste."